Preparation of the root of a tooth indicated for extraction in such manner that the buccal/facial root section remains in situ with its physiologic relation to the buccal plate intact. The tooth root section’s periodontal attachment apparatus (periodontal ligament, attachment fibers, vascularization, root cementum, bundle bone, and alveolar bone) remain vital and undamaged to prevent the expected post-extraction socket remodeling and to support the buccal/facial tissues. The prepared tooth root section acts as a SS and prevents the recession of tissues buccofacial to an immediately placed implant. A 28-year-old man reported with the chief complaint of loose pin and cap in upper front teeth region and wanted to get it replaced. Extraction of the root stumps using SST and rehabilitation, by placing implants in the region of 11 and 21 was planned. No relevant medical history was found. Figure 1] shows preoperative clinical picture. Initially a long and sharp straight bur was used to perform an initial split of about 7mm, then bur was extended to the length of the root, and the large lingual root fragment was removed, whereas the smaller buccal root fragment was retained. The height of the buccal socket shield was reduced to the level of bone so the crestal part of the root fragment on the gingival part descends 3mm below the tip of the gingiva. 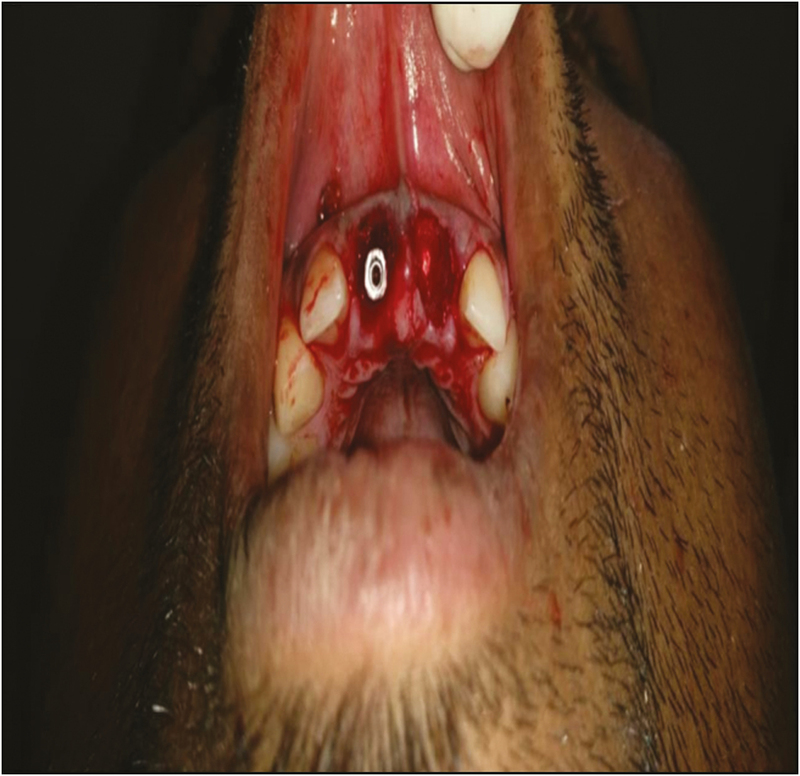 Osteotomy was performed and implant was placed without touching the remaining buccal root fragment [Figure 2]. Bone graft was placed in between the buccal root fragment and the implant. Guided tissue regeneration membrane around the straight abutment was placed and sutured [Figure 3]. Immediate postoperative orthopantomograph was made [Figure 4]. 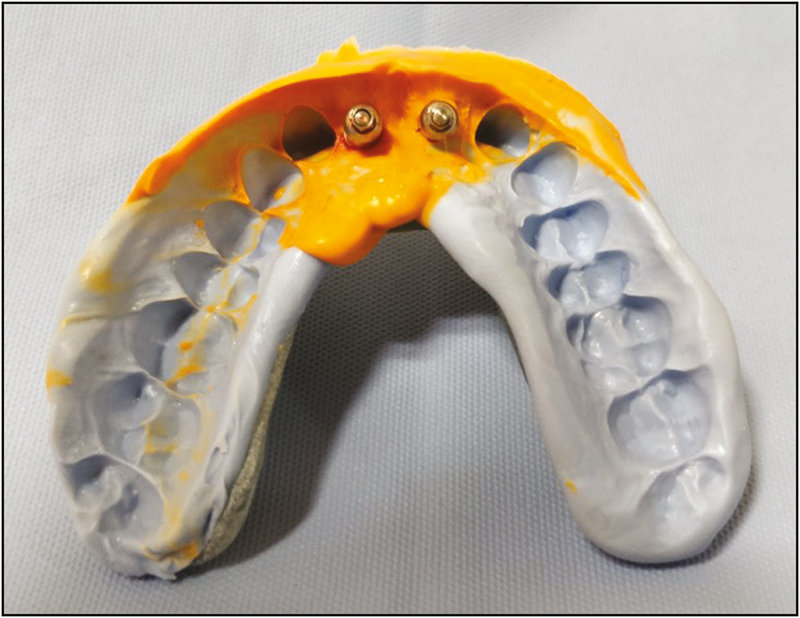 Prosthesis: After 3 months of complete osseointegration, open tray impressions were made, followed by resin trial and metal try in, and the final prosthesis was delivered [Figure 5] and [Figure 6]. There is still insufficient evidence to support the SST with simultaneous implantation. Only a few case reports are available showing variable data of bone loss. In a case–control study in 2014, a medium vertical bone loss of 0.8mm was reported in 26 implants on 25 patients after 24 months of follow-up., In a prospective clinical case series study, the marginal bone loss was reported to be 0.7mm on average after 6 months. In a retrospective study on 10 patients in 2017, a mean bone loss of 0.33mm in mesial and 0.17mm in distal were reported. In a recent systematic review, the authors found a horizontal bone loss of 1.07mm and vertically of 0.78mm after the immediate placement of implants. Usually, this horizontal bone loss has to be compensated by bone augmentation and/or a connective tissue graft. Although the amount of marginal bone loss in the SST is still not conclusively proved, current clinical experiences seem to point to a minimal, negligible, or even nonexistent bone loss after extraction. As a consequence of this, soft tissue grafting would not be necessary in most of the patients treated by this technique. In the aforementioned case–control study in 2014, the authors found a significant difference in aesthetic impact when comparing the SST to the conventional technique. Needless to say that if grafting is not an aesthetic requirement to compensate the horizontal bone loss, the treatment becomes more patient-friendly with less duration and morbidity. Nevertheless, the SST is an operator-sensitive procedure, delicate to handle, and sometimes very hard to perform. In this case, the first provisional bridge on abutment teeth allowed the patient to comfortably wear a fixed temporary prosthesis during the healing time of the immediately implanted sockets. This bridge was not used to shape the soft tissues. The staged extraction approach avoided a major tissue loss and contributed to maintain a more aesthetic tissue architecture. To support, a 6-unit prosthesis by only two implants and with two cantilevers in the canine positions could also be a reason for discussion. Another option previously discussed with the patient was a full-arch prosthesis splinting the two new implants to the four preexisting ones. The patient was satisfied with the recently restored posterior quadrants and rejected it. A three-fixed superior rehabilitation scheme allowed us to perform a simpler treatment with better acceptance by the patient. 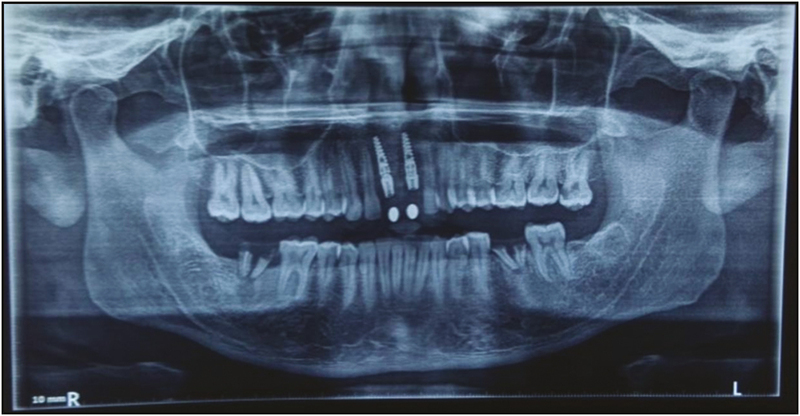 Given the evident bruxism, the number of implants could be considered low for the anterior bridge—six teeth on two implants—but there is a growing clinical evidence about lower number of implants to support a full arch. Should a proper occlusion be achieved and the patient wears an occlusal splint, the distal cantilevers seem not to be a problem. Since decades, clinicians have been trying to avoid the loss of alveolar volume by leaving root remnants. In an old study on 2000 patients, the authors reported that a 16.2% of the root remnants resulted in pathological condition signs, especially when exposed to the oral environment. Although numerous papers since the late seventies dealt with the so-called “root submergence technique,” this still remains a controversial issue. The uneventful healing of sockets with root fragments has been well documented. Both vital tooth retention and submergence of endodontically treated roots [13,14] have been recommended: Aesthetic appearance after 6-month follow-up. Two cases with SST complications were reported. In first, lateral incisor restoration with the shield communicated with oral cavity. In second, first premolar was with luxated shield on implant second stage. Implant failed at the last case after 4 months. This concept has been recently applied to teeth- or implant-supported fixed prostheses for pontic site development.,, On the basis of this background, a decision was made to leave the canine roots instead of performing a more invasive surgical procedure for extracting them. One of the main factors for the success of the SST is precisely that the root fragment does not come in contact with the external medium, something that could facilitate the infection and also be an aesthetic problem. A human histologic study has been recently published, showing osseointegration between an implant surface and a dentin surface of a root fragment from a SST, making the technique further promising. The SST has presently not enough clinical evidence for being suggested as a routine option. It appears that if the proper clinical requirements are met and the technical handling of the operator is appropriate, the SST could minimize the resorption of the buccal tissues after the tooth extraction. In selected cases, the immediate placement of implants with the SST seems to be a useful tool for the replacement of the teeth lost, especially in the aesthetic area. Bäumer D, Zuhr O, Rebele S, Hürzeler M. Socket shield technique for immediate implant placement—clinical, radiographic and volumetric data after 5 years. Clin Oral Implants Res 2017;28:1450-8. Abadzhiev M, Nenkov P, Velcheva P. Conventional immediate implant placement and immediate placement with socket-shield technique—which is better. Int J Clin Med 2014;1:176-80. Troiano M, Benincasa M, Sanchez P, Guirado J. Bundle bone preservation with Root-T-Belt: case study. Ann Oral Maxillofac Surg 2014;2:7-2. Lee CT, Chiu TS, Chuang SK, Tarnow D, Stoupel J. Alterations of the bone dimension following immediate implant placement into extraction socket: systematic review and meta-analysis. J Clin Periodontol 2014;41:914-26. Buser D, Chappuis V, Belser UC, Chen S. Implant placement post extraction in esthetic single tooth sites: when immediate, when early, when late? Periodontol 2000 2017;73:84-102. Glocker M, Attin T, Schmidlin P. Ridge preservation with modified “socket-shield” technique: a methodological case series. Dent J 2014;2:11-21. 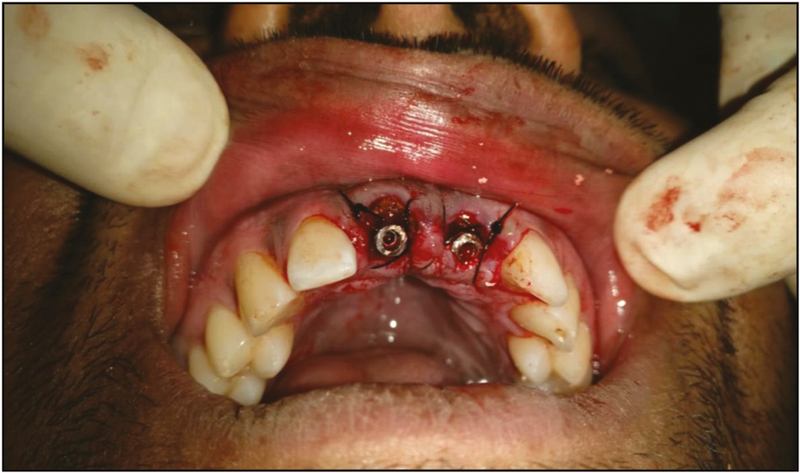 Mijiritsky E, Mazor Z, Lorean A, Mortellaro C, Mardinger O, Levin L. Transition from hopeless dentition to full-arch fixed-implant-supported rehabilitation by a staged extraction approach: rationale and technique. J Craniofac Surg 2014;25:847-50. Romanos GE, Gupta B, Eckert SE. Distal cantilevers and implant dentistry. Int J Oral Maxillofac Implants 2012;27:1131-6. Casey DM, Lauciello FR. A review of the submerged-root concept. J Prosthet Dent 1980;43:128-32. Helsham R. Some observations on the subject of roots of teeth retained in the jaws as a result of incomplete exodontia. Aust Dent J 1960;5:70-7. Siormpas KD, Mitsias ME, Kontsiotou-Siormpa E, Garber D, Kotsakis GA. Immediate implant placement in the esthetic zone utilizing the “root-membrane” technique: clinical results up to 5 years postloading. Int J Oral Maxillofac Implants 2014;29:1397-405. Gongloff RK. Vital root retention. A 5-year experience. Int J Oral Maxillofac Surg 1986;15:33-8. O’Neal RB, Gound T, Levin MP, del Rio CE. Submergence of roots for alveolar bone preservation. I. Endodontically treated roots. Oral Surg Oral Med Oral Pathol 1978;45:803-10. Welker WA, Jividen GJ, Kramer DC. Preventive prosthodontics–mucosal coverage of roots. J Prosthet Dent 1978;40: 619-21. Wong KM, Chneh CM, Ang CW. Modified root submergence technique for multiple implant-supported maxillary anterior restorations in a patient with thin gingival biotype: a clinical report. J Prosthet Dent 2012;107:349-52. Comut A, Mehra M, Saito H. Pontic site development with a root submergence technique for a screw-retained prosthesis in the anterior maxilla. J Prosthet Dent 2013;110:337-43. Choi S, Yeo IS, Kim SH, Lee JB, Cheong CW, Han JS. A root submergence technique for pontic site development in fixed dental prostheses in the maxillary anterior esthetic zone. J Periodontal Implant Sci 2015;45:152-5. Schwimer C, Pette GA, Gluckman H, Salama M, Du Toit J. Human histologic evidence of new bone formation and osseointegration between root dentin (unplanned socket-shield) and dental implant: case report. Int J Oral Maxillofac Implants 2018;33:e19-23.